Okay, I’m caught up through January 17, I’m going to call it a wrap for this week’s links. … but they’re not calling it that. Wizards of the Coast announced they are working toward the ‘next iteration’ of D&D (they are being coy about calling it 5e, but many people aren’t). To anyone likely to be reading this blog, it is unlikely to be news. As expected, this has pretty much set the RPG blogs on fire. I do not expect to be posting much about it, though I have been invited to a playtest group from someone I respect and I plan to take part. However, when I find a particularly insightful post I may mention it here. This week I’ve stumbled on three posts describing managing overland travel using a node graph rather than just the pictorial or hex map. The weird thing is that I have designed my scenarios and campaigns for years using node graphs, but I had never considered exposing that to the players. Blue Boxer Rebellion, Hill Cantons, and Twenty Sided all describe using such maps in relatively transparent fashion, and it makes sense to me to do so. You could hide it so the players have to crawl through the hexes in order to get where they are going, but I’m at a loss to say why this is a good idea. This project is almost half way funded, and there is still more than two weeks left. The project is half funded, and I’d really like to see this one come through. Here is a picture showing examples of what you can expect to see on the tokens. 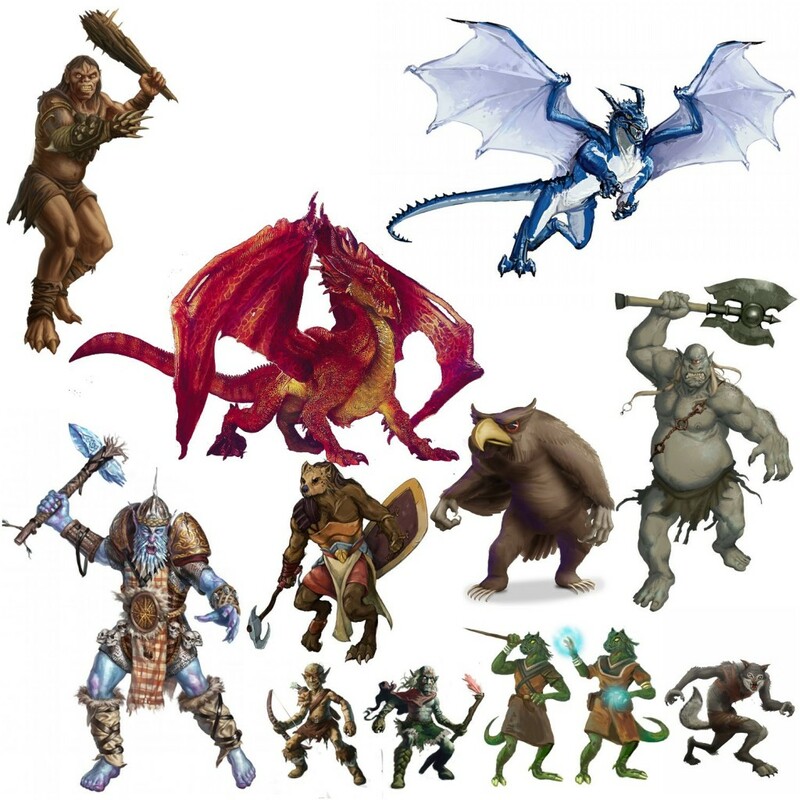 They are not necessarily to scale (I’m pretty sure those dragons should be bigger compared to the smaller humanoids). As best I can tell, this will be some pretty solid quality and good volume for the price, and I expect to be able to put them to good use. JB presents Land of Ice (Monsters, Part 2): Fen Troll, Frost Worm, Ghoul, Hawk, Herd Animal, Hill Troll, Horse, Ice Kraken, Ice Toad, Iceland Wolf, and Jotun. We also get Land of Ice (Monsters, Part 3): Long Fang, Magician, Mule, Northman, Sea Snake, Shark, Sleipnr, Sobold, and Snow Rat. While not particular RPG-related, Berin’s advice on Setting Goals to Better Achieve Them is just good, solid advice. Doug describes how he does maps, and it doesn’t particularly involve pretty pictures or cartography until somewhat late in the practice. Curiously, I read this shortly after ckutalik’s system of ‘Point Crawling’ (see the Hill Cantons, below). craggle provides a Situation Generator that can be used to randomly generate (or be used for inspiration for) a scenario. Satyre presents another damned city: scissaxa, sinking into a swamp and cannibalizing itself to stay alive. I was scrolling through Fantasy Ink‘s recent posts to decide whether or not I want to add them to my aggregator. I ended up adding it; the various book covers make me want to look up artists and book series and whatnot. The occasional light cheesecake does not go amiss — or is a Miss, I suppose — either. To be honest, I think that we’ve got the wrong direction when it comes to this sort of thing. MRW describes the movie Your Highness. I’d seen a trailer or two that suggested this may be of interest, as long as I don’t take it too seriously. MRW’s description of the movie bears this out. Not terribly good, but it has its moments and fantasy reader/rpgers will probably find it funnier than most. It is actually a fairly amusing parody of any given overwrought fantasy novel and feels like you are watching a roleplaying session where the GM is trying to emulate one of those overwrought novels, but is constantly undermined by the players’ refusal to take it completely seriously. Something that interests me more, though, is the number and variety of game entities identified from the movie that could be used elsewhere (the hand of the hydra looks potent but hazardous, two things I sometimes look for in magic). Silly movie that is an idea mine? I’ll add it to the list of things to be watched, though perhaps not near the top. Kris talks about Why Fourth Edition Died. I don’t see anything here to disagree with strongly, but bear in mind that I lack specific knowledge of D&D 4e to really rebut this meaningfully. That is, while I agree that powers and other abilities are the most fun when they let you break the rules, I cannot say for certain whether D&D 4e powers do or do not do this. I remember reading a Dragon article that said that the purpose of feats was to let you break rules, and from what I could see the ones that let you do so were the most fun. Giving a +1 bonus to your attack rolls or +2 bonus to weapon damage is useful, but it is hardly exciting. This is a really long article, but I find it quite insightful, and I’ll be looking to it when working on Echelon. Greywulf starts a breakdown of what various editions of D&D did right (and a bit of what they did wrong), starting with D&D 4e (Stats, Hit Points, Power Sources and Abilities, The Three Tiers, and Easy Encounter Building). The second part relating to D&D 4e covers Background Options and Themes, Monster Stat Blocks, and Points of Light. He shows a little bit about DAZ Studio (the standard edition is available for free right now… it’s about 440MB, I’ll look into it after the download finishes). Depending how flexible it is in the modeling — and these are the guys who sell Bryce, so I expect it’s pretty good — this may become a handy tool for me. The skill deconstruction continues, this time covering Perform and Profession, Sense Motive, Survival and Swim, and finally Use Magic Device. Did I mention that I suspect that by the time he’s done, there will be almost no skills left that aren’t consider heavily flawed? Ckutalik describes how he manages movement between places in his sandbox. While he does have a hex map, it is less a hex crawl than a node graph, a ‘Point Crawl‘. He makes a very good observation, that most travel is along some kind of track or linear feature or something, that trackless travel is relatively difficult and dangerous to the traveler. Since most points of interest are likely to have some kind of track leading to them (even if it is obscured or only usable by certain creatures) it stands to reason that it would be workable to have a map that identifies the points of interest and the paths between them. Given the choice between wandering into a trackless unexplored hex, and following a broken-down old road into another unexplored hex, I suspect that all else being equal the PCs would likely follow the broken-down road — at least they know it went somewhere. I want to think about this some more, but I think it makes much more sense for my sandbox than a simple hexmap would. It gives the players information they can use to make a meaningful decision, rather than a random one. We also see a bit of numismatic lore (stuff about coins), including both the formal names and the slang terms used. I especially like the two-silver entry in the conversion table, mostly because I can see it being used. It comes to me that an investigation of cockney slang would be a really good investment in devising this sort of thing. Flynn provides us with a template for summarizing a location’s information on a single page. This template is synthesized from the Quick and Dirty Overland Encounter List Template and the Quick and Dirty Location Template (both at Gnome Stew). I’d like to compare this to the Entity Definition template I’ve been using. This looks more concise, but I’m not entirely sure we’re asking the same questions. I think I can use this template to flesh out my own, though. Aardy R. DeVarque compiled a list of all fonts used by TSR and WotC. He was always good at compiling lists (and maintaining the FAQ if I recall correctly) back when he was still hanging out in rec.games.frp.dnd… but this must have been a challenge. Clean, simple, the information is easy to find and read. The art is appropriate, the silhouettes are very useful and well-placed at the end. It may make it a little table-heavy on the first page, but I would consider trying to find a way to get that third table to the front. It looks like a good balance of flowing text to not-flowing-text (tables and pictures); you don’t have a big WALL OF TEXT to make it tedious. I might try tweaking a few things if I had nothing better to do, but this looks useful and attractive. Go take a look, it’s good stuff. Not nearly as nice, Matt gives us the first preview of Abaddon. Chris provides Twenty Quirks of Dwarven Culture… some have little bearing, some could be critical, most have at least a bit of a twist to them. In The Meaningful Megadungeon Roger describes an unfortunate design pattern — dungeons tend to be fairly consistently filled, and a rectangle the size of the paper they are drawn on. Convenient, isn’t it? He also suggests a way around this, using Dungeon Tetramorphs that looks pretty clever to me. Simple once you think of it, but that to me is a hallmark of a good idea. Chuck Wendig provides advice regarding a writer finding his or her voice, identifies 25 Things Writers Should Stop Doing, and 25 Things Writers Should Start Doing. Talysman’s is one of the first blogs I started reading, when I got more heavily into blogging. I’ve often overlooked it (not in the RPGBA, as far as I can tell, so it wasn’t showing up in my regular feed), but he is a really solid source of good randomness and of geomorphs and other mapping information. This week he has presented a megamodule, a small section of map with specific purpose that could be inserted into a larger map. Something like a design pattern — not the software one, but the architectural patterns the Gang of Four modeled theirs after. Here he presents an Abandoned Wizard’s Laboratory and a Great Spiral Stair. Trollsmith expands on his hex mapping series to discuss how the terrain might be influenced by the nature of those living there. That is, the ‘nice, good people’ don’t live in the ‘nice, good place’ because that’s where they settled, but because of the nobility of their king. Similarly, the trolls and giants are why their lands are twisted and close to uninhabitable. This is almost exactly backward of what I have been doing, but both are viable approaches… and I’d like to explore the idea a little further. I have read DM of the Rings at Twenty Sided, irregularly (it’s on my list of things to get into, but it’s large enough I’ve been putting it off until I had a big enough block of time to marathon it… that isn’t already marked for other purposes. This also prevented me from digging into the RPG blog part of the site. A link from one of the node-based navigation pages I’ve linked to above pointed me at how Shamus guides player movement in overland situations.